If you are a dinner theater enthusiast looking for a unique variety show experience with a silly twist, then the Oh Canada Eh? Dinner Theater is just what you are looking for! The Oh Canada Eh? 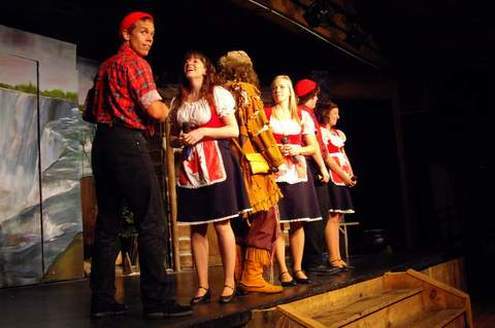 Dinner Theater's Rustic Log Cabin facility is located "just minutes from the brink of Niagara Falls" and dinner shows are offered April through October with a variety of musicals offered during the winter months. The show that we enjoyed included The Singing Mountie, the Hockey Player, Anne of Green Gables, Klondike Kitty and more. This comedic and musical celebration of Canada is appropriate for audiences of all ages and we saw patrons ranging from families with children to the mature tour bus crowd. As we watched the various acts, our performers served their "famous all-Canadian, family-style meal" which included French Canadian pea soup, homemade bread, fresh garden salad, roast beef, fresh Atlantic haddock, Manitoba roast chicken, vegetable medley, roasted potatoes and maple chocolate cake for dessert. There is some truth to their humorous question, "At what other restaurant will you be served your meal by a singing Mountie?" The Oh Canada Eh? Dinner Show has entertained over 650,000 guests from around the world and is the seven time winner of Niagara Falls Attraction of the Year. Now in their 18th season, the two-hour show features all-Canadian music from maritime folk songs to modern pop and a flag-waving finale that claims to make you "feel proud to be Canadian even if you're not, eh?" Tickets to any performance of the Oh Canada Eh? Dinner Show start at $56.50 per adult. Tickets to Winter Musicals (performing November-March) start at $48.50. Show-only tickets are also available for our Winter Musicals at a cost of $25 per adult. Children 16 and under are free in the MAPLE section of seating for Oh Canada Eh? and all Winter Musical Performances (with the exception of New Year's Eve).Tickets to the Rocky Horror Show are available starting at $29.95. This is a SHOW ONLY performance and does not include any meal. This show is not recommended for any children under 16 years of age.